Vitamin K is necessary for good health, and adequate intake usually comes from a healthy diet. Primary sources of vitamin K are green, leafy vegetables, such as collard greens and spinach, but other healthy foods also contain this vitamin. 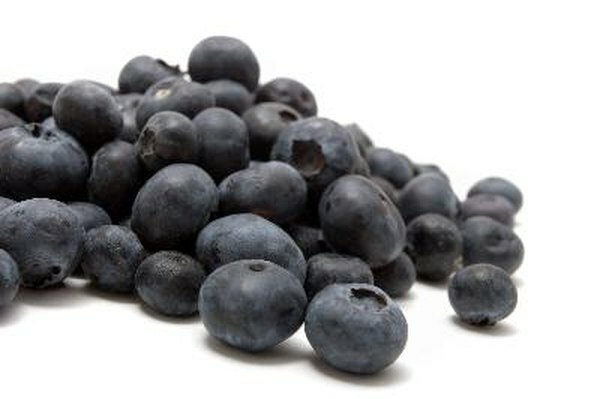 Although blueberries comparatively contain relatively low levels of vitamin K, they still add a healthy dose. Vitamin K is known to play an important role in normal blood clotting. When you are injured, normal blood clotting is necessary to avoid excessive bleeding and possible death. Vitamin K plays an important role in bone health, too. The Food and Nutrition Board recommends that adult women consume 90 micrograms of vitamin K per day. One cup of frozen, sweetened blueberries provides 40.7 micrograms of vitamin K, while 1 cup of raw blueberries contains 28 micrograms. Comparing this to 1 cup of cooked spinach, which provides 889 micrograms of vitamin K, blueberries provide relatively little of this important nutrient. However, because vitamin K is an important factor in good health, adding any vitamin K to your diet is positive. The Harvard School of Public Health notes that only one in four Americans meets vitamin K recommendations from diet. A diet lacking in green, leafy vegetables often corresponds with a lack of vitamin K. So, although adding blueberries is helpful, it's best to have your diet also include a lot of vegetables to ensure adequate vitamin K intake. Regularly add spinach, kale, turnip greens, lettuce, Brussels sprouts and broccoli to your meal plans. Cooking foods with vitamin K-rich canola oil and soybean oil will also add to your daily intake. Other popular berries, such as cranberries, are the source of controversy when it comes to vitamin K intake. An 8-ounce cup of cranberry juice contains little vitamin K -- about 2.5 micrograms. However, if you're taking the blood-thinning medication warfarin, cranberry juice may have adverse effects on the drug's effectiveness. In general, vitamin K intake needs to be moderate and stable when taking warfarin, but cranberry products and cranberry juice should be avoided because of potential impact on the drug.